TOTAL FLANKER...a rugby blog: Whatever happened to: Rugby Football? 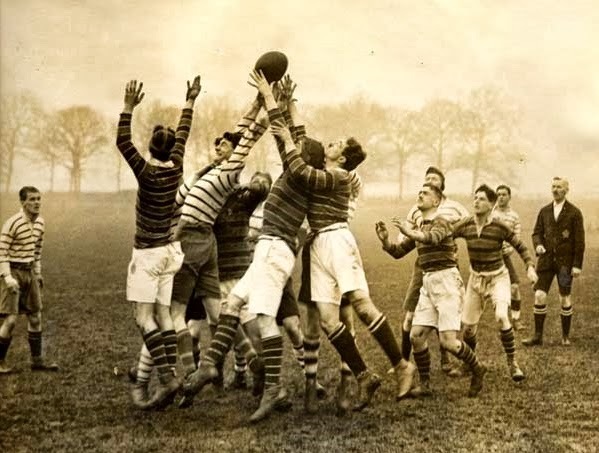 Whatever happened to: Rugby Football? OK, it's just possible that I may have bitten of a little more than I can chew here, but here's a question: Whatever happened to Rugby? Let's face it, rugby (to paraphrase Jimmy Greaves) is a funny old game. How many other sports are there, for instance, where the laws of the game either change more or less every season or are subject to a mystifying plethora of refereeing interpretations which seem to depend on where the game is being played, where the referee was born or whether there's an R in the month? Was it always thus? I seem to recall a time when very little seemed to change in the game. Back in my playing heyday (uh-oh, here we go) I admit to remembering very few changes taking place - the try being amended from 4 to 5 points, for instance, or the team driving a maul forward being denied the subsequent scrum put-in, or the team kicking a penalty into touch being awarded the throw-in. The point is, however, that such changes were few and far between - so much so that they stick in the memory, as opposed to the myriad of largely forgettable experimental law tweaks that players, referees and spectators are confronted with today. Crouch, Bind, Set? Just bloody get on with it, man! And another thing. Once upon a time props propped, locks jumped and a tackling fly half was something of a collectors item. Nowadays not only is everyone is expected to tackle like dervishes, they even count the number of tackles you make in a game, for heaven's sake. Not only that, I also seem to recall that the object of tackling used to be to bring your opposition to ground, not to knock him into the middle of next week. Rugby has always been a tough game, but the head-on collisions these days are just brutal - no wonder concussion is such a big topic of debate in the game right now. Look, I'm not a complete Luddite. I do recognise that the game is faster and more dynamic than in yesteryear and that players are bigger, stronger, fitter and quicker. But is the game really any better? With scrums remaining largely shambolic, with the lineout often nothing more than over-choreographed nonsense, with rucks largely involving a static morass of prostrate bodies and with space on the field being at an absolute premium, I do often find myself asking: Whatever happened to Rugby? Labels: rugby, Total Flanker, Whatever happened to? I enjoy being a curmudgeon too! There's nothing quite like possessing the power of being able to walk into any room and dragging the atmosphere down. New kit for Wales...and it's red! Whatever happened to James Haskell?